We will send a text to this number, confirming your appointment. Here are some of the questions that we are frequently asked! WHAT DOES A MEMBERSHIP AT COLAB INCLUDE? Your office has access to Wi-Fi. Private IP addresses and server storage are available at an additional cost. All plans include a monthly credit allocation that can be used to reserve both conference rooms and workspaces at virtually all Co-Lab locations worldwide (the number offered are specific to membership type and office size). Reservations can be made online or on-the-go via our mobile app. Connect with other members through our online community. You can ask questions, share stories, announce product launches and other good news, invite others to events, promote your job listings, or simply find someone to grab a beer with. It’s a great way to start meaningful relationships with creative entrepreneurs and business leaders. Dedicated Desks and Private Offices include desks, chairs, and lockable filing cabinets. Co-Lab has at least one multi-function copier/scanner/printer. Dedicated Desks and Private Offices come with monthly credit allocations specific to your office size. Co-Lab is a community of industry leaders and innovative entrepreneurs. Meet and connect with like-minded people and companies at our weekly and monthly events. Check out some of our past events to learn more! WHAT MEMBERSHIP PLANS DO YOU OFFER? A shared workspace in a common area. When you purchase a Hot Desk, there is no need to reserve a particular workspace in advance each day; you can come and go as needed between the opening time and use any available desk 20 hours a week. This plan includes access to our digital Member Network, events and discounted creative services, 2 monthly credits for reserving workspaces and conference rooms. An assigned desk space in a large open area or enclosed office shared with other members. This dedicated space comes with a lockable filing cabinet for your personal belongings. Desktops may be set up and left overnight. This plan includes access to our digital Member Network, events and services as well as 5 hours credits for reserving workspaces and conference rooms every week. A fully enclosed, lockable office space. Your company can add on more offices as you grow. This plan includes access to our digital Member Network, events and services, 24/7 key access at your primary building, as well as monthly credits for reserving workspaces and conference rooms that correlate with your office size (minimum of 12 credits for a 1-person office). DO ALL MEMBERSHIPS BEGIN ON THE 1ST OF THE MONTH? Hot Desk and We Membership plans begin the day you sign up and are billed monthly. Private Office and Dedicated Desk membership plans begin on the 1st of the month. Our one-calendar month move-out policy requires move out on the last day of the month for Private Offices and Dedicated Desks, allowing new members to move in on the 1st of the month. If this day lands on a weekend, arrangements will be made accordingly. ARE YOUR MEMBERSHIPS REALLY MONTH-TO-MONTH? Yes! Our flexible month-to-month commitment provides you with the stability of an office along with the flexibility you need to grow your business. WHAT IF I'M LOOKING FOR A PRIVATE OFFICE OR DEDICATED DESK MORE THAN 30 DAYS IN THE FUTURE? If you’re looking to schedule a start date on a longer timeline, please speak with a Community Manager at your desired location. We’re happy to discuss potential options with you. WHAT ARE YOUR BUILDING HOURS? WHEN ARE YOU OPEN? CAN I STOP IN OR SHOULD I MAKE AN APPOINTMENT FOR A TOUR? Tours must be scheduled in advance. This ensures our availability and helps our team focus on helping you choose the best Co-Lab space. Give us a call at 01509390282 or email us at [email protected] to schedule a tour! AM I ALLOWED TO BRING MY DOG? WHAT'S YOUR PET POLICY? Our pet policy varies by building. Please ask the Co-Lab Community Manager when you take a tour for the most up-to-date information. If you plan on bringing a pet to the building, you will be solely responsible for any injury or damage caused by your pet to other members or their property. Co-Lab is not responsible for any injury to any pet brought into a Co-Lab building. In addition, any pet brought into a Co-Lab building must be vaccinated. We reserve the right to restrict your ability to bring your pet at our discretion. WHAT IS THE AVERAGE SQUARE FOOTAGE OF A Co-lab OFFICE? Every Co-Lab office is uniquely designed and total square footage differs from location to location. Each office provides more than enough room for a team to work comfortably. Schedule a tour to check it out for yourself! WHAT IF MY COMPANY NEEDS PHONE SERVICE? Phone service is currently only available for Private Offices. If your team has VoIP phone service that you’d like to maintain, simply plug into the ports in your office at no additional charge. HOW DO PRINTING CREDITS WORK? Dedicated Desk and Private Office membership plans include a monthly credit allocation that can be used for both colour and black & white prints and copies. After you have used your allotted printing credits, you are free to keep printing and copying at additional costs – see below for more details. Credits do not rollover from month to month. CAN I ADD MAIL AND PACKAGE HANDLING? Both Hot Desk and Dedicated membership plans do offer for mail and package handling, but only at select locations. If you would like to add mail and package handling, please reach out to the local Community team at your desired location. There is an additional fee of £50 per month. Mail and package handling is included for Dedicated Desk and Private Office membership plans. CAN I HAVE MULTIPLE MAILING ADDRESSES FOR ONE ACCOUNT? No, we are unable to support multiple mailing addresses for one account. HOW DO RESERVATION CREDITS WORK? Co-Lab Membership, Hot Desk, Dedicated Desk and Private Office plans all include a monthly reservation credit allocation that can be used to reserve conference rooms and workspaces. After you have used your monthly meeting room and workspace credits, you are free to make additional reservations at a cost of £5 per credit in all. A daily workspace reservation costs 2 credits. Conference room reservations vary depending on the size of room and length of reservation. HOW DO I RESERVE A CONFERENCE ROOM OR A WORKSPACE? You can make a reservation for a meeting room or a workspace via either the Member Network or on the co-lab website. For workspaces, you just need to select a location and the desired date. For meeting rooms, you’ll also be able to select available rooms at our locations based on the room size and length of the reservation. For both workspace and conference room reservations, we have a first-come, first-served policy and recommend making a reservation as early as possible to guarantee availability. WHAT SIZE MEETING ROOMS DO YOU HAVE? Meeting room size varies per location. Generally, our meeting rooms accommodate teams of 4–6. A daily workspace provides access to a designated work area in a shared common room, working side-by-side with other co-lab members. You’ll have ample space to set up your laptop for the day, a power port and Wi-Fi. In addition, you also have access to a host of amenities specific to the building. All plans allow you to make workspace reservations at any of our Co-Lab Membership/Hot Desk–friendly locations. co-lab is constantly growing, and you can view our view our current locations here. WHEN CAN I RESERVE A WORKSPACE? Workspaces can be reserved Monday through Friday from 9 AM to 6 PM local time. You can reserve as many days as you would like on an a la carte basis at a cost of £5 a day. I BOOKED A CONFERENCE ROOM/WORKSPACE AT THE WRONG LOCATION. HOW DO I CHANGE IT? You may edit a workspace reservation up to 24 hours in advance and a meeting room reservation up to one hour (60 minutes) before your meeting. You can edit your reservations both via the website. I HAVE A WE MEMBERSHIP PLAN. CAN I BOOK A CONFERENCE ROOM/WORKSPACE ON THE WEEKEND? At this time, a Co-Lab Membership plan only allows access to workspaces and conference rooms from Monday to Friday from 9 AM to 6 PM local time. I HAVE A MEMBERSHIP PLAN. DO I HAVE TO RESERVE A WORKSPACE BEFORE COMING INTO WORK? No. But in order to ensure our members have the best possible experience, and to guarantee availability, we require that you reserve a workspace at least one hour before you plan on coming into work. I JUST RESERVED A CONFERENCE ROOM. HOW DO I REGISTER MY GUESTS? To register guests, please log on to the Member Network or the co-lab website. Alternatively, you can call on 01509390282. You may register as many guests as allotted for the particular conference room, including yourself. CAN I REGISTER GUESTS FOR MY WORKSPACE? At this time, we do not offer the option for Co-Lab Membership or Hot Desk membership plans to have guests in our common area workspaces. If you would like to have a guest work with you for the day, you are welcome to book the meeting room as you require. CAN GUESTS VISIT ME IN MY PRIVATE OFFICE? Yes. Just make sure you register them either via the Member Network or on the co-lab webiste. I'M READY TO SIGN UP! WHAT ARE MY PAYMENT OPTIONS? For Hot Desks and Dedicated membership plans you must pay by credit or debt card via our website. Alternatively, speak to one of our staff or email us on [email protected] for more options. IS THERE A RETAINER OR SET UP FEE REQUIRED TO SECURE A DEDICATED DESK OR PRIVATE OFFICE? Yes. 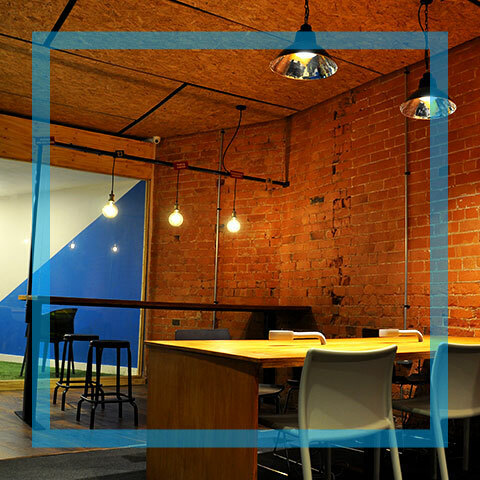 Co-Lab requires you to pay a deposit of £99.99 co-working space and £450 for Private office in addition to your membership fee. This deposit will be refunded when you cancel your membership. WHEN DO I HAVE TO LET CO-LAB KNOW I'M MOVING OUT? Members with Dedicated Desks or Private Offices are required to give one-calendar month notice to move out or transfer offices. Move out forms must be submitted by the last business day of the month prior to vacating. Example: If a member wants to move out on August 31st, they must give notice to co-lab on July 31st. Hot Desks and Co-Lab Memberships can be cancelled at any time online via the Account Manager on the Member Network, but please note that cancellations take effect on the last day of the current month. There are no prorated refunds issued for cancellations of Hot Desk and We Membership membership plans. AM I ABLE TO TRANSFER TO ANOTHER CO-LAB LOCATION? Yes! If the building of your choice has availability, we will work with you to organize a seamless transfer to the building of your choice. I AM A CURRENT CO-LAB MEMBER AND LOVE MY SPACE! DOES Co-lab GIVE REFERRAL REWARDS? Yes! Our referral program rewards co-lab members with 10% of the monthly Membership Fee of the Member who signs up for up to one year. This applies only to Dedicated Desk and Private Office membership plans. There are no limits to the number of referral rewards a member may earn. MY COMPANY HAS GROWN OUT OF ITS CURRENT SPACE. DOES Co-lab BUILD SPACES FOR TEAMS LARGER THAN 12 PEOPLE? Yes! co-lab now offers private spaces for teams of 12 or more. As your team begins to grow, tell your Community Manager and we’ll find the perfect space for you. DOES CO-LAB CHARGE LATE FEES? Co-Lab charges a late fee of 10% of the outstanding invoice, excluding Service Retainers, for payments we haven't received by the 10th business day of the month. Please see your Membership Agreement or contact us at 01509390282 or www.letscolab.co.uk for more information. HOW CAN I REVIEW MY MONTHLY INVOICE? You can view your monthly invoices any time online via the Account Manager on the Member Network. Just select the “Invoices” tab and you’ll be able to make the appropriate adjustments. Please note that for Private Offices, only the primary member has access to the Account Manager and can view invoices. MY COLAB MEMBERSHIP / HOT DESK MEMBERSHIP IS INACTIVE. CAN I REACTIVATE MY MEMBERSHIP? Yes, and we’d love to have you back! Please contact us at 01509390282 or email us on [email protected] letscolab.co.uk for more information. HOW DO I CANCEL MY WE MEMBERSHIP OR HOT DESK MEMBERSHIP PLAN? You can cancel your Co-Lab Membership or Hot Desk Membership online via the Account Manager on the Member Network, but please note that cancellations take effect on the last day of the current month and that there are no prorated refunds issued for cancellations of Co-Lab Membership and Hot Desk membership plans.